Dr. Kim featured in Canadian Auto News! Dr. Kim has recently been featured in Automotive News Canada for his and his groups contribution to automotive research! A big congratulations to SMSD alumnus, Dr. Li and Dr. Kim for their newest journal paper publication in Automotive Engineering. Dr. Li and Dr. Kim developed algorithms for multi-material topology optimization considering compliance minimization problems for automotive applications. Be sure to check out the latest issue of Automotive Engineering for a great read of the paper. Expanding Research Suite with GM Canada! Dr. Kim and SMSD are thrilled to announce that the current collaboration with General Motors Canada will be expanding into a suite of new research topics. Look forward to new focus in topics including design optimization, topology optimization, lightweight design, multi-material design, large-scale optimization, and parts integration over the coming years of the research collaboration. New Research in Metal Coated Polymers! SMSD and Dr. Kim are excited to announce a new research collaboration with General Dynamics! Expanding from a previous research collaboration with General Dynamics investigating the analysis of metal coated polymers; SMSD will now be working towards “Multi-physics Modeling and Topology Optimization for Metal Coated Polymer Structures”. We look forward to the revelations that will come from this collaboration. Expanded Research Collaboration with Magna Powertrain! Congratulations to Dr. Kim, Magna Powertrain, and SMSD for their recently expanded research collaboration in ultra-high strength steels. The new venture will explore “Automotive Weight Reduction through Nonlinear Finite Element Modeling, Fatigue Analysis, and Optimization of Hot Stamped Ultra-High Strength Steels”. Look forward to exciting publications in the future. 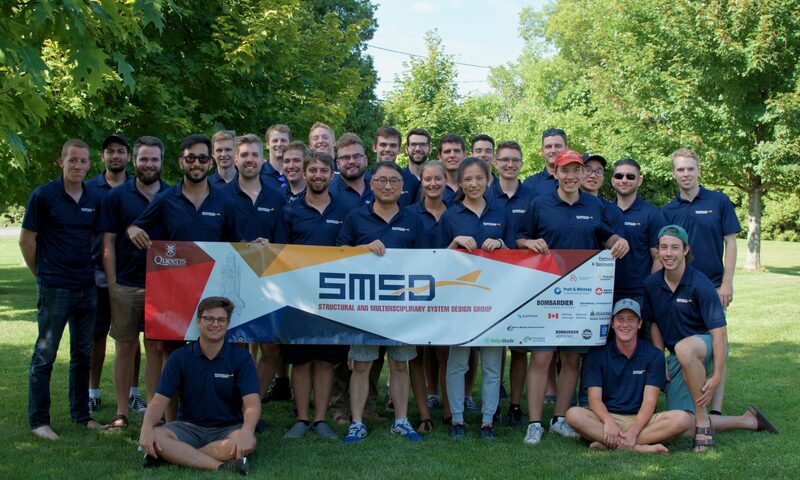 We are excited to announce that SMSD will expand our partnership with Pratt & Whitney Canada into Multi-disciplinary Topology Optimization for Metal Additive Manufacturing under Uncertainty. We look forward to a profound collaboration over the coming years. Congratulations to Jon Wong who has successfully defended his masters thesis, “Design Optimization of Aircraft Landing Gear Assembly Under Dynamic Loading“. We have thoroughly enjoyed working with Jon over the past 2 years and wish him the best of luck with his future endeavors.